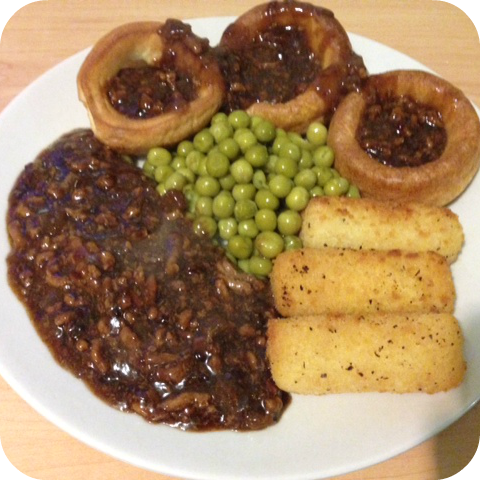 One of my favourite things to make is mince and onion in the slow cooker – it’s easy, reasonably cheap and is so versatile that once it’s made, we can eat is as it is or turn it into lots of other different meals. Add the minced beef to the slow cooker along with the onion and the carrot if you’re using it. Crumble the stock cubes over the top. Pour over enough boiling water to cover the mix. The more water you add at this point, the more gravy you’ll end up with at the end so it’s up to you really. Give it a good stir, put the lid on and cook for 5-6 hours. Just before you serve it, sprinkle in enough gravy granules to thicken the gravy to how you like it. If you’d prefer you could add some dumplings and have mince and dumplings or if you fancy peeling some potatoes, top it with mash and have cottage pie. It’s great on jacket potatoes, inside a giant Yorkshire pudding or just spooned on top of a pile of mash. Any leftovers could be made into a pie or you could even make some savoury pancakes with this as the filling. Previous Post Be ready to adapt your meal plan…. Next Post Think quick when you see a bargain – Spicy Butternut Squash soup recipe….